Recent reports say Uber is hiring multiple investment banks to underwrite its IPO. Keep in mind that while Lyft will more than likely beat Uber to the public markets, the valuations won't even be close. 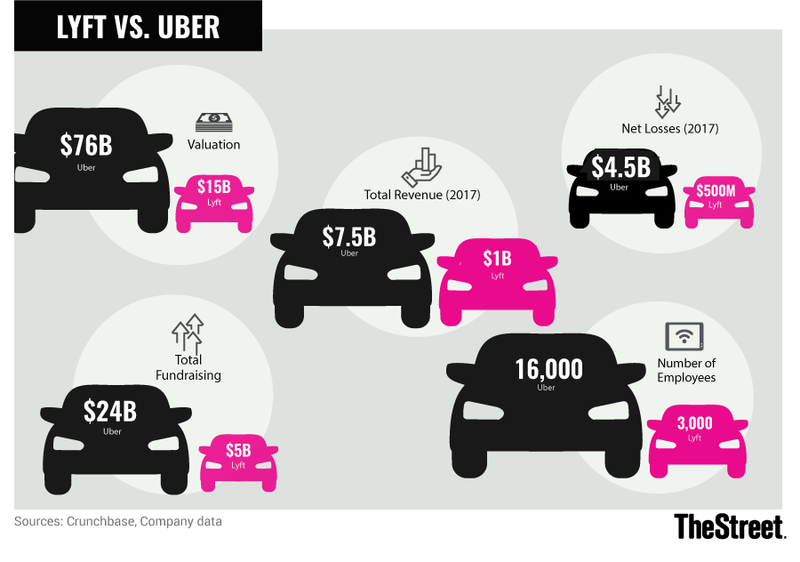 Estimates suggest that Lyft will garner a valuation between $20 billion and $25 billion when it files for its IPO, while Uber will likely be in excess of $100 billion and perhaps push up toward $120 billion. Do investors realize that would almost make Uber more valuable than Tesla (TSLA - Get Report) , General Motors (GM - Get Report) and Ford (F - Get Report) combined? These valuations, particularly Lyft's because it's smaller and going first, could skyrocket if we only get a sliver deal. Meaning if the company only offers a small fraction of its stock on the open market, causing a buying frenzy as demand far outpaces supply and drives the stock (along with the valuation) drastically higher. But short of a disastrous debut for both Lyft and Uber IPOs, there's one company that's set to make out big: Alphabet (GOOGL - Get Report) (GOOG - Get Report) . Back in October 2017, it was reported that Alphabet invested $1 billion in Lyft back when it had an $11 billion valuation. Some back-of-the-envelope calculations would suggest its stake may roughly double, provided Lyft is able to snag a $22 billion IPO valuation. But doubling up on its stake in Lyft isn't the only thing Alphabet management can cheer about this year. When Uber IPOs, Alphabet will also cash in on it. First, Alphabet invested $258 million in Uber back when it had a valuation of just $3.76 billion. But the company subsequently sold some of its stake when SoftBank (SFTBY invested in Uber a little more than a year ago. After that, though, in February 2018, Alphabet received another 0.34% equity stake (valued at $245 million at a $72 billion valuation) when Waymo and Uber settled their self-driving lawsuit between the two parties. At this point, it's unclear what Alphabet's exact stake in Uber is. It likely stands between 5.5% and 6.5%. At the midpoint of GOOGL's stake and using a $100 billion IPO valuation for Uber, that gives Alphabet a massive stake of about $6 billion. Not bad for a $258 million investment and a settlement a few years later. Obviously should Uber fetch a higher valuation -- say for $120 billion -- Alphabet's stake will go even higher. Thanks to new accounting rules, last April, Alphabet recorded a $3 billion gain in its equity holdings, although it's unclear where the gains specifically came from. Investors speculate that a majority of it was from Uber, which had recently raised capital at a new valuation. It's impossible to know Alphabet's true stake in Uber, but it goes to show how much more could be on the line should Uber garner a large valuation from its IPO. In all, Alphabet should make out well on its ride-hailing bets. Others who should benefit include Sequoia, Toyota (TM - Get Report) , Tencent (TCEHY and SoftBank, which seemingly has its hands in everything.